Following is more reflective information about our 2016 show Garden of Quilts. Friday, Oct. 14, 2016 10 a.m. to 5 p.m.
​The featured artist at the Chino Valley Quilters' Garden of Quilts show will be local quilt artist and founding member, Roberta Akin. Roberta will be sharing her beautiful and creative quilts and quilt projects. Roberta is one of our founding mothers. ​The quilt exposition floor features displays of member quilts and a competition judged by show attendees. 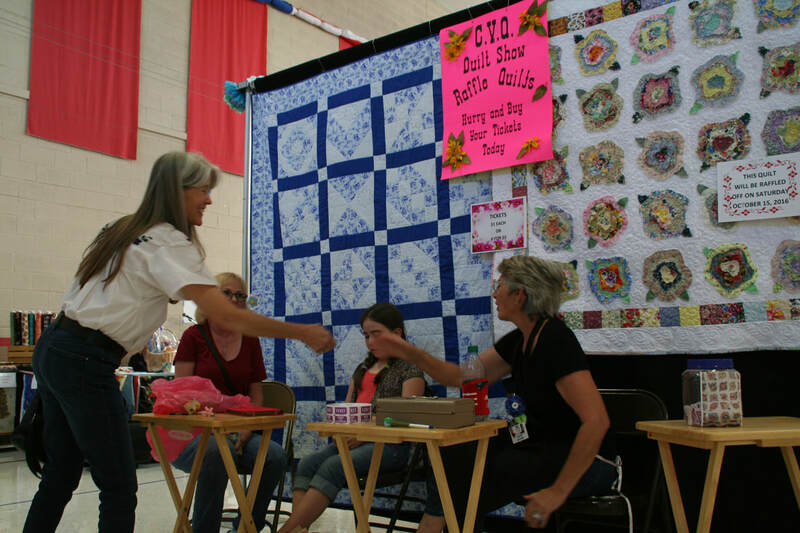 Daily demonstrations are presented by quilters with expertise in areas such as piecing, antique quilts, free-form quilting, cutting, binding and more. Make-Take projects will be available for a nominal fee. The Show Boutique offers hand-crafted items for sale and our Vendor Fair features suppliers of fabric, notions, sewing machines and more, plus organizations, appraisers, authors and quilting specialists. Drawings for beautiful raffle baskets will be held at the end of the show on Saturday. The raffle baskets were such a huge success at our 2014 show that we promise more of the same at this year's show. So, come early and get your raffle tickets; you will have the opportunity to win one or even more of these outstanding baskets! Presentation of our latest Opportunity Quilt, Spirit of Chino, will be just one highlight of the show. Raffle tickets will be available at the show. Drawing for the quilt will be held at our regular October guild meeting approximately one year from the quilt presentation. The quilt Funds raised help to support our ongoing community work.